Stock Analysis | We provide analysis on stocks based on fundamentals and technical, which helps the common man in evaluation of their Investment decision. Earning: Hydro One’s (Grey Market: HRNNF, TSX: H) diluted earning per share (EPS) excluding extraordinary items increased by 56% in Q3.2016 compared to Q2.2016; it was the same as Q3.2015. Also, basic earnings per share for the year-to-date (September 2016) was $0.99 compared to $1.14 for the same period in 2015. In Q3.2016, Hydro One lagged behind in earnings by $0.15 in comparison to Q3.2015. In Q4.2016, the earnings should be $0.30, in order to achieve the results similar to 2015; this is 100% higher than the earning for the period Q4.2015 and 23% lower than the earning for the period Q3.2016. 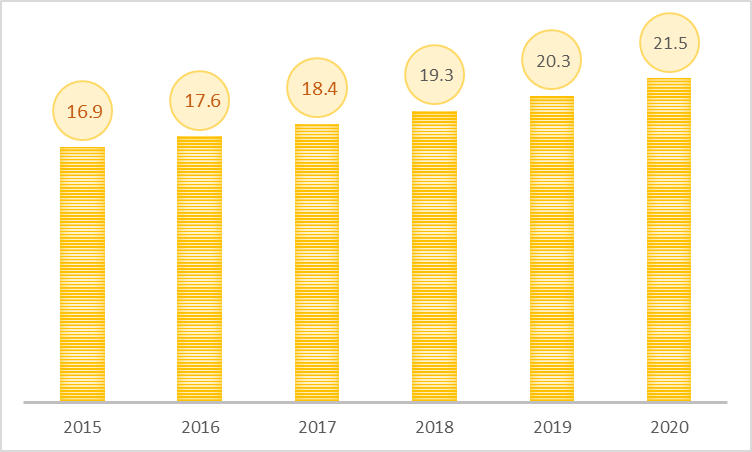 Capital Expenditure: Capital investment was $1,220 million during a 9-month period (ending in September 2016) as compared to $1,212 million during a 9-month period (ending September 2015); this is 1% higher than in 2015. This means the capital expenditure was more or less similar to 2015. Acquisition of Great Lakes Power Transmission and Orillia Power Distribution: Acquisition of Great Lakes Power Transmission was completed in Q4.2016. At the same time, Hydro One reached an agreement to acquire Ontario based Orillia Power Distribution. These are strategic acquisitions, which place Hydro One in a strong position as an electricity distributor and transmitter of electricity in Ontario. This also will help to increase net income in the long run through an increase in rate base and synergies. Change in senior management: These changes are considered favourable since the organization made these changes to achieve a higher target, increase integration between different departments, and become more profitable. Revenue is higher than last year by 6% primarily due to changes in the distribution rates and higher peak transmission demand on account of warmer weather in 2016; this was partially offset by the divestiture in Hydro One Brampton. Hydro One is regulated by the Ontario Energy Board (OEB), which is a regulator for Ontario gas and electricity distribution and transmission services. Hydro One’s approved return on equity (ROE) in 2016 was 9.19% for both transmission and distribution segments. It’s approved rate base for 2016 was $16.90 billion ($10.04 billion for transmission and $6.86 for distribution). The deemed capital structure included 60% of debt and 40% of equity for both of its businesses. Hydro One’s ROE was either the same or greater than its allowed ROE on a consolidated basis over the past five years. Acquisition and Merger: In 2013, ex- banker, Ed Clark, recommended to the Ontario Government to promote consolidation in the Ontario electricity distribution sector. Furthermore, he recommended that Hydro One be privatised in order to promote the consolidation. These recommendations were based on the opinion that consolidation would reduce costs and result in synergy. Consequently, customers will receive value for money. Hydro One is taking advantage of Clark’s recommendations; they are taking a very aggressive position on merger and acquisition. In recent years, Hydro One has acquired four distribution companies and one transmission company which includes Norfolk Power (August 2014), Haldimand Hydro (June 2015), Woodstock Hydro (September 2015), and Great Lake Transmission and Orillia Power (October 2015). Cash Position: Hydro One’s capital structure is 51% debt and 49% equity, compared to the deemed capital structure of 60% debt and 40% equity. The capital structure is favorably off by 9% (or $1.8 billion). This also means that Hydro One’s capital structure is not optimised and there is room for improvement. With reference to fixed assets, funding to Hydro One in rates is for depreciation which is annually in the range of $700-$800 million while capital expenditures are in the range $1,600-$1,700 million. The remaining unfunded portion of $900 will be funded by 60% financing through debt and 40% through equity. The cash flow is sufficient to fund their capital program, acquisition and merger. Rate Base: Rate base can be defined as a value of the assets of a utility company. The rate base helps the local government in determining the price that the utility company is allowed to charge its customers. The rate base determines prices because it helps to ensure a reasonable profit for the utility company while keeping utilities affordable for the customers. Hydro One’s rate base is consistently growing. The primary reason for the growth is increase in plant properties and equipment (PP&E) as a result of increased annual capital spending compared to depreciation expenses for the year. As per their forecast, this increase in rate base is also projected in future years. I do not see any funding risk and regulatory risk since they have continuously proved to the regulator about their capital expenditure’s need successfully. Dividend Paying: Up to September 2016, the dividend was $0.76 compared to the EPS of $0.99 which was 77% of the net income. The dividend was almost 3.2% of the average stock price during 2016. I considered it favorable to the investor. Since the customer is getting a steady income at the same time it also shows that the company is generating cash. In recent years, Hydro One has acquired electricity distribution and transmission companies to grow their business. This will help them to grow their net income and dominate the utility sector in the province of Ontario. Their rate base has increased in recent years, and growth is also forecasted for the future. This will further help them to increase their net income. In addition, their balance sheet and cash position is strong enough to fund their strategy. The company also showed their capability to maintain operational efficiency and generate net income more than regulated approved return on equity. So, I opine that it is worthwhile to invest in Hydro One stock due to their efforts to increase the net income which consequently will result in an increase in market capitalisation. During Q3, six major events happened which can impact Hydro One (HRNNF). Out of the six events, two were related to acquisitions, three were related to senior management change and remaining one event was related to storm cause outage to the customers. 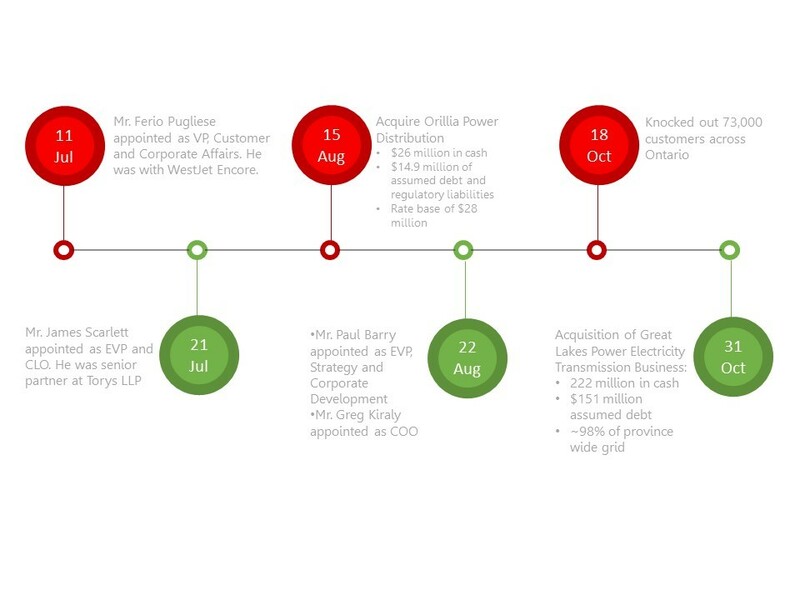 Let’s analyze the impact of these events on Hydro One’s 2016.Q4 results. Acquisitions: Hydro one acquired Orillia Power and also completed the process with regulator to acquire Great Lake Power Electricity (GLPE). Orillia Power: Orillia power is owned by the City of Orillia, which is in the business of electricity distribution within the municipal boundary of Orillia, Ontario. Orillia was paid $26 million in cash by Hydro One and assumed debt and regulatory liabilities of $15 million. The price is more than twice its book value. In addition, Hydro one committed to decrease of 1% rates to its customers from year 1 to year 5. And also, the rates will increase less than the inflation for the period of year 6 to year 10. It also guaranteed in year 11 onwards sharing of $3.4 million through ESM (earning sharing mechanism). Precisely, In short, the premium paid for the acquisition is more than 100% with cap on growth in funding for next 10 years. This cost will be recovered through synergy. GLPE: GLPE is in the transmission business that connects northern Ontario with southern Ontario. Hydro One paid $222 to purchase GLPE. Further, rebasing will happen after ten years in Jan 01, 2027. As per the 2013 financial statements, Equity of GLPE is $110.35 millions. ESM (50:50) is offered during the last five years of deferral period where earnings are above 300 basis point. In short, premium paid in this acquisition is more 100% of the book value. Both the acquisitions carry high premium with no growth for 10-15 years which is considered significantly a long period. This will have a negative impact on ROE in the long term. Moreover, the impact of these acquisitions, will not be visible in 2016.Q4. Even in future the impact will not be visible since both the acquisitions are so small in size as compared to Hydro one equity of 9,759 million in 2015. Change in senior management: I will consider these changes quite favourable to the organization. The changes made by the organization is generally to achieve a higher target, increase integration between different departments and become more profitable than present. The impact of change in management will not be visible in short term. Storm: According to another news, 73,000 customers were knocked out due to storm. This was unpredictable and carried high costs. The additional costs due to storm would have an unfavourable impact on financial scenario and will be visible in Q4.2016 reporting. In the above discussion, it is expected that Hydro One results should be slightly below than anticipated and prior period.